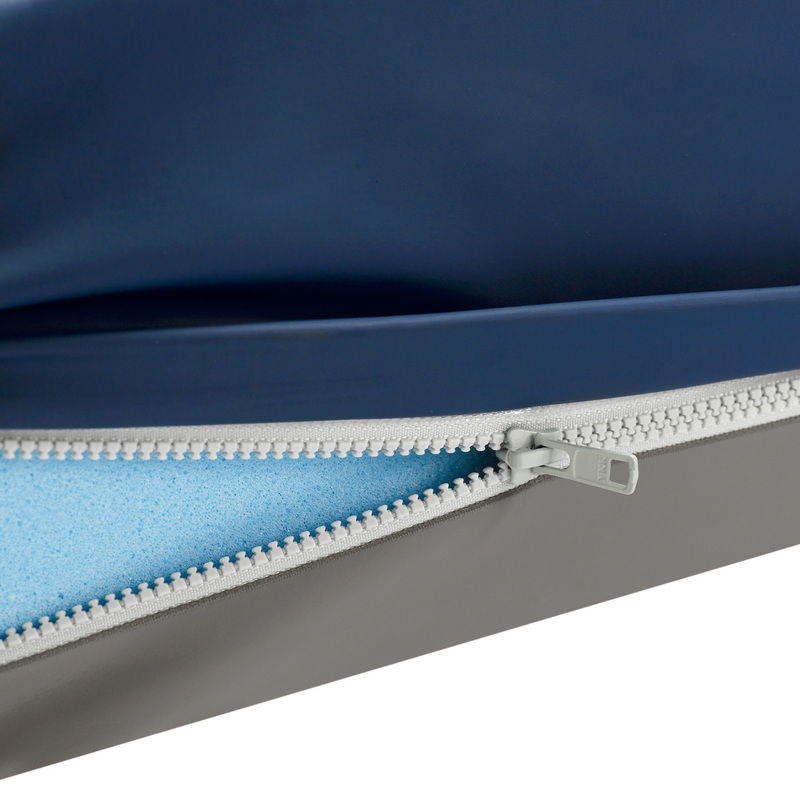 Keyhole cut cells provide constant support and comfort for those at high-risk of pressure ulcers. 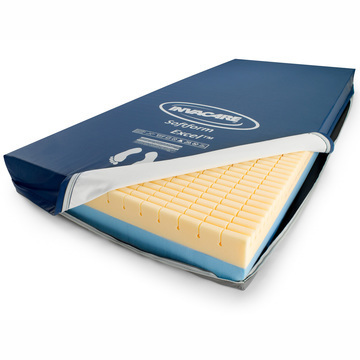 The Invacare Softform Excel Mattress contains a contoured foam layer designed to distribute the patient's weight evenly which promotes healthy blood flow and helps reduce the risk of pressure ulcers or sores from occurring. Patients that spend much of their time in bed are always at risk of developing these ulcers due to the minimal amount of repositioning that they can perform on their own. The base mattress also features a firm foam layer that provides enhanced support for users. 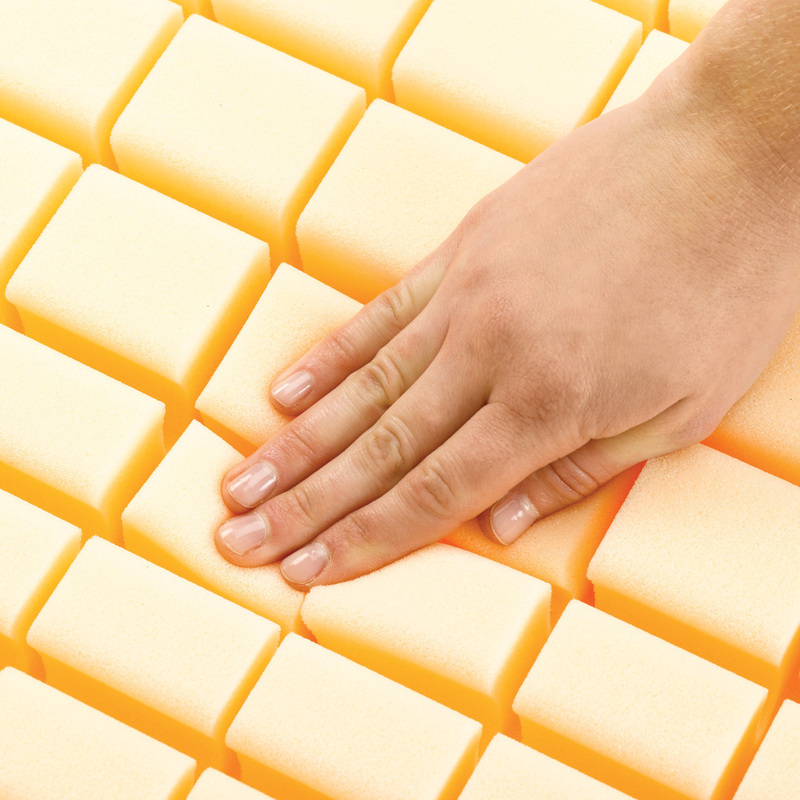 Unique castellated cells break the surface tensions of the foam, allowing the patient to be immersed into the foam, maximizing body contact area and optimizing pressure reduction. The Softform Premier mattress features premium HR foam cut into mushroom-shaped cells to allow superior patient immersion and pressure redistribution. 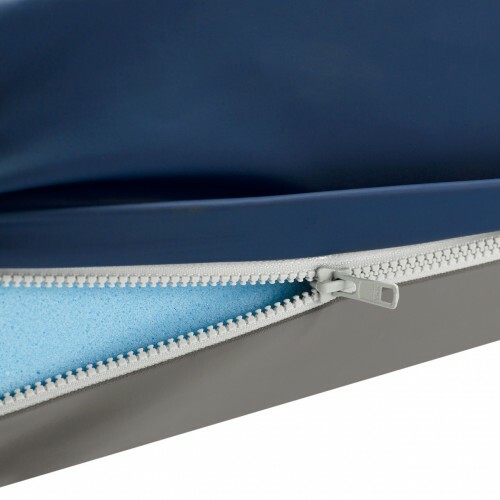 The Softform Excel mattress features a unique keyhole cut to ensure proper airflow through the foam to maintain a consistent temperature while moving with the patient for improved comfort. 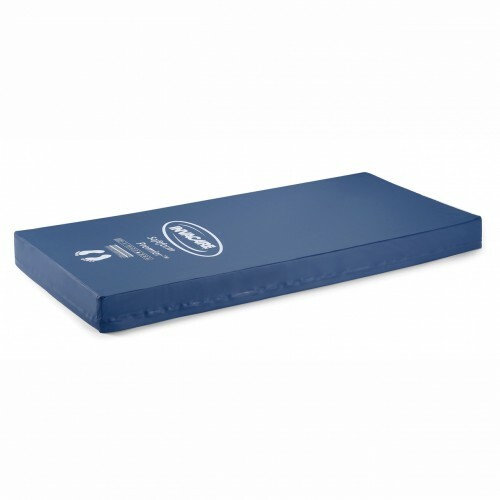 Softform mattress covers are four-way stretch polyurethane and feature a tough coated polyurethane base to extend the longevity of the mattress. The Softform Premier mattress features high frequency welded seams; the Softform Excel Mattress features stitched seams. (Softform Premier mattress cover shown). Caregivers and family members that are caring for an individual that is suffering from a condition that forcibly requires them to stay in bed for a majority of the day must be educated on the ill effects and prevention of decubitus ulcers, otherwise known as bed sores. Also known as pressure sores, pressure ulcers or decubitus ulcers, these irritating wounds are caused from prolonged weight on the skin that is in contact with a bed or wheelchair. Bedsores are agonizing, require a significant time to mend and are also at the forefront of life-debilitating complications, for example, skin and bone diseases. This is why products such as the Invacare Softform Excel Mattress were designed, to minimize the risk of pressure ulcers by adequately providing a cushion that relieves pressure from the specific area that is being cut off from circulation. It’s important that you highly consider these tips to help improve the wellbeing and overall health of the individual being cared for. The human body is intended to be in constant motion even while we rest. We continually move positions, whether it be straightening out ourselves in bed, working on a computer, sitting in front of the TV or whatever dynamic or idle interest draws us in. But how do bed sores form? Bed sores tend to occur in the ranges where we have minimal cushioning of muscle and fat, particularly directly over a bone. The tailbone (coccyx), shoulder bones, hips, heels and elbows are some of the more common areas for bedsores. Factor in idleness, for up to 12 hours, and you have a recipe for the common bed sore. 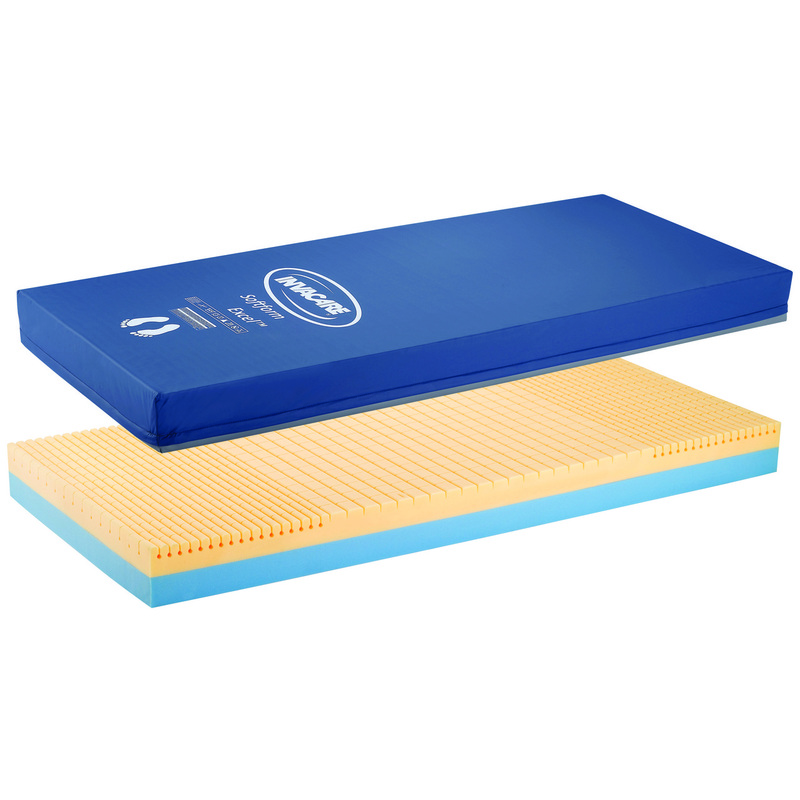 Consider purchasing a specially designed mattress that is engineered to minimize skin damage like the Invacare Softform Mattress for ideal care. Circulation is essentially blocked when the blood stream moderates or stops in the packed zone amongst bone and the surface of a bed or wheelchair. At the point when the tissue is denied of oxygen and supplements, the skin can die and become infected in as little as a day’s time, in spite of the fact that the confirmation of the ulcer may not be evident for quite a long time or even weeks. Whenever surgery, damage to the spinal cord, or a sickness causes idleness, the weight of the immobilized body on specific zones can separate the skin. In a standard bed, the most perilous ranges are the tailbone or posterior and the heels. The toes, lower legs, knees, hipbones, shoulders and shoulder bones, and even the edges of the ears can also be at risk. In a wheelchair, the areas that are prone to danger are again the tailbone and rear end, shoulder bones and the spine, and the backs of arms and legs that touch the seat. Some issues like joint inflammation or injury that make moving difficult or impossible drastically increase the occurrence of these bed sores. Diabetics and paraplegics who have no feeling in their lower extremities are particularly at risk. Two other reasons that bed sores occur on patients are through shear and friction. Shear occurs when the skin moves in one direction while the bone underneath moves the opposite. Gradually sliding or drooping down in a bed or seat can bring about the skin to extend and tear. Exchanging from bed to wheelchair or the other way around can likewise bring about skin tears from shear. Friction also has the tendency to tear skin. Despite the fact that incessant changes in position are essential to counteract bed bruises, the consistent development and rubbing can again separate skin. The gentlest bit of assistance can even cause skin damage, particularly since human skin gets more tender and delicate with age.